The French war deserter Guy Josselyne returns for another adventure in another part of the world. This time Guy finds himself in a Japanese city called Jihang. Jihang is a small city in the middle of nowhere, surrounded by forest. It is controlled by a mysterious criminal organisation called The Sons Of Yang. Although the local police force is spending huge amounts of resources to clean the city of crime, it is still unable to take down The Sons Of Yang. This is mostly because the criminals somehow manage to control almost every building that is not under federal supervision. There is also another local criminal organisation, the Dragon Brotherhood. They are not considered as powerful as The Sons Of Yang, but there are rumors going around about the Dragon Brotherhood trying to take control of the city of Jihang. International Killing Money is also making business in the area, and here, like everywhere else, IKM is considered untouchable by the local federal forces. The reason for this is simply that IKM is providing money and resources to the city, and that IKM and the Sons Of Yang seem to have made some sort of agreement about how things are run. -Fixed issues with Sons Of Yang missions. -A couple of new Locals missions added. -Prison sentence time changed from 3 minutes to 2. -Some other small stuff added and bugs fixed. Please report any bugs or issues so I can fix them for the next release! Downloading now. I absolutely loved the first GTH and I can't believe you made a sequel. I thought you had disappeared because I don't think I have seen you since I have been around. Well it was a privilege to approve this file :) It's fantastic to see people that were designing years ago are still here, and going strong. You can make a map like this to play online? that would be great because everybody would play and you would become famous as the creator of cba tenchy, not if you know the map that is 4 units castles leave you depending on your unique civilization. * The first two missions from the Sons of Yang will complete without you having to do anything, if you wait long enough. I think this might be due to police units destroying the buildings, but I'm not sure. * It seems like everyone and his dog has it in for Guy Josselyne, and will chase him to the end of the Earth and back. This led to me spending a lot of time hiding inside a castle waiting for my health to regenerate so I could pop out and get a few hits on the army of hostile units milling around outside before my health disappeared again. * Having to wait before being released from prison is not fun. All I did once I ended up in prison was save and reload, which is the same thing I'd have done if I'd been defeated, so the entire "Soul Saver Card" mechanic is pointless. * The single track on loop throughout the entire game gets annoying. * After the third mission from the Sons of Yang, the player is given no further direction on where to go for objectives and gold. This..Campagin inspired me to make a Grand Theft Horse And GTH II Soundtrack. This campaign works realy well! The just right level of diffculty helps alot...This mod is real entertaining. The Strongest Part of this campaign is the balance..Everything felt like grand theft auto itself...Everyone hates you...the police fight you and gangs want your buisness. The author of this campaign should be real proud of themself. this campaign is very creative...lots of places to visit and many more areas to cause mayhem at. The Design is amazing! Lots of diffrent landmarks, visuals, and many many other things that makes this campaign stand out from others. The instructions were good but they were at sometimes hard to understand...The Story was great! Just like the last GTH it has a well wrote story. 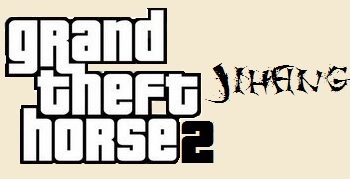 Will a 3rd Grand Theft Horse Be Made? I am a lovin these..Campaigns you made. While playing the campaign..i was inspired to make a soundtrack for both Grand Theft Horse Campaigns. Thank you a lot for the review, and thanks for the comments and issue reports! Version 1.0 has just been released. SomeAmericanTeen that sounds like a pretty cool idea. Of course you can post the download! I have..had a arguement with myself over where the..soundtrack's could go...I keep saying Projects but then i conflict with that idea...It's not done yet but the Soundtrack will have 11 stations with at lease 45 songs each. These are hand picked by me. Grand Theft Horse: Jihang by Madaste is the sequel to the 2008 scenario Grand Theft Horse: Trazeng. It is inspired by the Grand Theft Auto video game series, as it is a free roam scenario in which you must acquire as much money as possible in order to leave the city. You can do this by performing many different crimes such as robbing banks killing millionaire or working for criminal organisations. Grand Theft Horse is a great and enjoyable scenario. It is very similar to the GTA games in terms of style and gameplay but obviously the gameplay is more limited and can't be completely replicated due to the AOK game engine and the fact it's set in the middle ages. The scenario is highly enjoyable and being a free-roam scenario there is lots to do. You can perform various missions for criminal organisations or you can take matters into your own hands and attempt to rob banks, kill millionaires or take on the police themselves. There is so much to do in the city and exploring it and the outside countryside is really enjoyable. However I did find that if you just stuck to the main missions and didn't do any free roam missions or exploring the game would be over very quickly. To complete the scenario you need to gather 4300 gold which can be acquired in about 15 minutes by doing a couple of missions and killing a few people. This meant there wasn't too much of a challenge in the main mission which disappointing me. I also found the music quite annoying. While it was quite humorous and funky, it was just one music file which was very repetitive and boring. It wasn't until near the end where I found the King to disable it. Maybe a hint as to this could have been made to tell the player at the beginning of the scenario. On a positive note though I don't think I found any bugs or lag that would affect gameplay in any way. The scenario was very well balanced. There were in game difficulty settings which determined how much gold you started off with. There are a lot of enemies out to get you; there are rival gang members, angry locals and gangsters that attack you, and when you kill them the police will get angry. The more you kill, the more police will be after you. However you can buy stuff from the IKM which will help like better Armour and Survivor Saver cards to respawn you when you die. I found that the missions were very well balanced. Some of the missions were very easy and didn't take much effort to complete while some involved you close to death and running for your life away from the police. No denying that this is a very creative scenario. Just like its predecessor, the Grand Theft Horse series by Madaste is the first of its kind; bring the gameplay and style of Grand Theft Auto to Age of Empires. The missions and side quests in the game of creative and have alot of different dynamic to them, each one being unique and individual. The city itself is creative and a lot happens there such as street brawls, gang fights and robberies to name a few. While the map design is strong and the city of Jihang is beautiful, I have to be honest in saying that the map design is one of the weakest points of the scenario. The city is beautifully designed and there is a lot of detail in it and lots of different places to explore such as banks, mansions and the police station. However there isn't much in the way of terrain mixing which makes the map look slightly unrealistic and more like the standard ES maps. There is also a lack of elevation in some places and there are huge chucks of land which are just very flat, which makes the map look bland and a bit boring and it also doesn't help in fights because you get no elevation bonus while attacking. The map needs more terrain mixing and elevation to spice it up and make it look less bland and boring. While there is a short story it's not expanded much in the scenario itself and it is very short. It explains who your main character is and what he's doing in Jihang. The story doesn't expand the gameplay at all and starts to make the scenario slightly boring. In my personal opinion the story is the most important part of the scenario. Without a good story the scenario is just a list of tasks and missions to do with no obvious reason or meaning. If you have a good story the rest of the scenario will fall into place around it. I know it's hard to add story in free-roam scenarios but maybe after competition of some missions you could add some backstory into the character just to give a bit of a structured story into who you are and why you've ended up in Jihang. The instructions are good. They tell you what to do in the main missions you are set. There are also some good hints on places to see and how to make some good money. I think though that sometimes the instructions could improve. Sometimes they were a little tricky to understand and sometimes it wasn't explained properly where you were meant to be going. Overall Grand Theft Horse: Jihang is a good scenario that is a good way to waste a few hours if you're bored. Despite a few minor flaws that I pointed out it is a really enjoyable scenario and I recommend it to everyone, especially those who play GTA and anyone who has played its predecessor Grand Theft Horse: Trazeng.